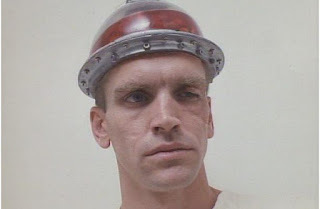 Ricky Chapman (Bill Mosley), the Santa suit wearing killer from Silent Night, Deadly Night 2 (1987) lies comatose in a hospital. He seems to have survived getting shot two dozen times, and now sports a transparent dome on his head, allowing doctors to see his brain slosh around. Dr. Newbury (Richard Beymer) employs a blind psychic named Laura (Samantha Scully) to probe Ricky’s mind. She doesn’t like what she finds, but before things can progress she’s whisked away by her brother (Eric Da Re) for a Christmas visit to their grandmother's house. Ricky rises from his medical bed, intent on following the psychic connection between him and Laura, and he will kill anyone who gets in his way. 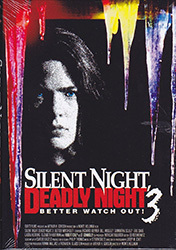 Silent Night, Deadly Night III starts out pretty weird and shows the potential to be a legitimately interesting story. It doesn’t tip its hand right away, letting the viewer experience Laura’s visions as she contacts Ricky’s mind. 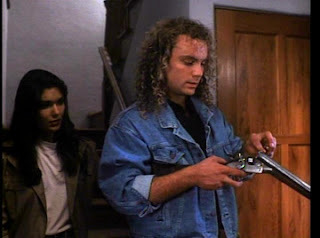 Once Laura is off on her trip, the movie slows down to a crawl and barely shows any life or excitement as we grind slowly towards Ricky and Laura’s final confrontation. "Make fun of my perm, huh?" It’s a tribute to Bill Mosley that he can wring even the slightest amount of menace or sympathy out of a character like Ricky, who is little more than a slowly lurching zombie. When your killer is a blank slate you need some stand-out characters to push against that and Silent Night, Deadly Night III has nothing to offer aside from the strange casting choice of Robert Culp as a jaded detective. There is also the sight of a pre-Twin Peaks Richard Beymer and Eric De Re on the screen, but sadly they don’t share much time together. Ricky’s brain is on display thanks to a transparent dome on his head which is surrounded by a cumbersome metal ring. It’s a strikingly odd look, but the movie never takes advantage of it. Secondary characters are, at best, mildly concerned about seeing it, if they even notice at all. The film misses out on a perfect opportunity to dispatch Ricky by smashing it and having gross brain chunks everywhere. The transparent brain dome is indicative of the problems the rest of the movie suffers, it introduces something with the potential to be unique and proceeds to do nothing with it. "Yeah, yeah, 'thinking clearly' I got it the first time." The movie almost manages to redeem itself with a truly oddball last moment as Ricky seems to offer the viewers at home some holiday wishes. The line and the direction are delivered with complete seriousness, so I don’t feel like it was meant to be a tongue-in-cheek closing scene, but I am completely unsure of what to make of it. Is it a last flash of brilliance in an otherwise disappointing movie? Silent Night, Deadly Night (1984) was cheap, grimy slasher movie, Silent Night, Deadly Night part 2 (1987) was a cheaper cash-in that became a cult sensation, Silent Night, Deadly Night III is sadly just a direct-to-video self filler.